In this tutorials, we are going to see how to work with Spring Boot Fileupload using Jquery Ajax. We can upload all types of files like text, pdf, img and videos in spring using MultipartFile interface. The MultipartFile is a representation of an uploaded file received in a multipart request. This file represents the global configurations for the application. Here I have mentioned my local path to save the uploaded document and given the maximum file size as 3Mb in fact it is a default file size. This form represents the details about the user. 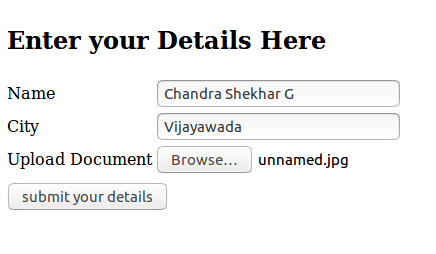 It expecting the name, city and upload document. Since this example is Spring boot Fileupload with AJAX, we have used the AJAX from JQuery. 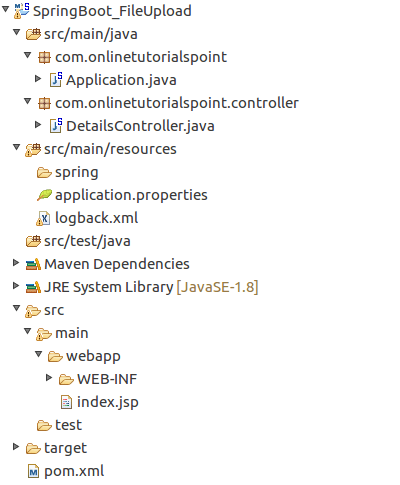 It is a typical Spring controller, as we discussed in the Basic Spring MVC Login Form Example. It has a method t0 handling the File upload functionality. It is a typical spring boot start up class as we have discussed the Simple Spring Boot Example. By clicking the submit your details button. 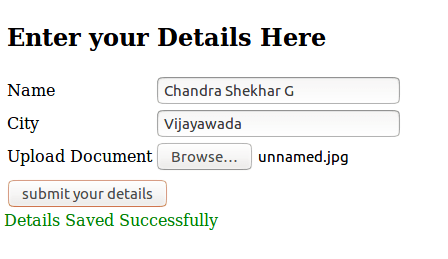 If every thing went well you can see the below success screen and you can find your uploaded file at given path (specified in application.properties).